You're here::Home/News, Training Tips/Metabolic Efficiency Testing — What is it and what can it do for you? Like many of you, I’ve been riding and competing for many years (sometimes at a national level, often with friends on the local single track). And like many of you I have been winging it, using my experience and knowledge to try and go faster and tire slower. Whether you are a cyclist like me, a runner or other endurance athlete, you’ll likely agree that the older we get, the more important it becomes to train “smarter,” not just harder or longer. While I acknowledge (begrudgingly) that I have gotten slower as I’ve aged, I have not lost my desire to compete and be challenged. So, how do I keep moving my own personal bar forward? Science! In the form of physiologic testing at Silver Sage Sports and Fitness Labs. To get this science-informed training going, I scheduled a metabolic efficiency assessment with Julie Young at Silver Sage one Friday afternoon this past February. We’ve all heard of carbo-loading before races or big events. The reason we load up on this fuel source is carbohydrates are most quickly converted into energy. However, the body can only store about 2,000 calories of carbohydrates (in the form of glycogen) so you and I will run out of carb energy after 2-3 hours of moderate exercise. In contrast, fats are more slowly converted into energy and the body has tons of fat to draw on (nothing personal, we all have tens of thousands of calories to draw on, no matter our size). 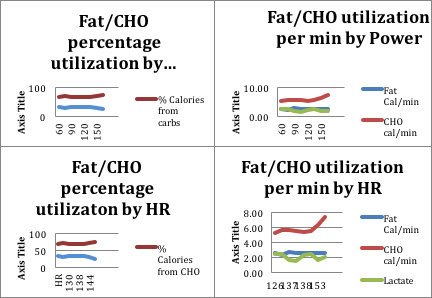 A metabolic efficiency assessment (ME) tells us how well our body utilizes fat as an energy source. Armed with this info, you can improve your efficiency through exercise and nutrition. 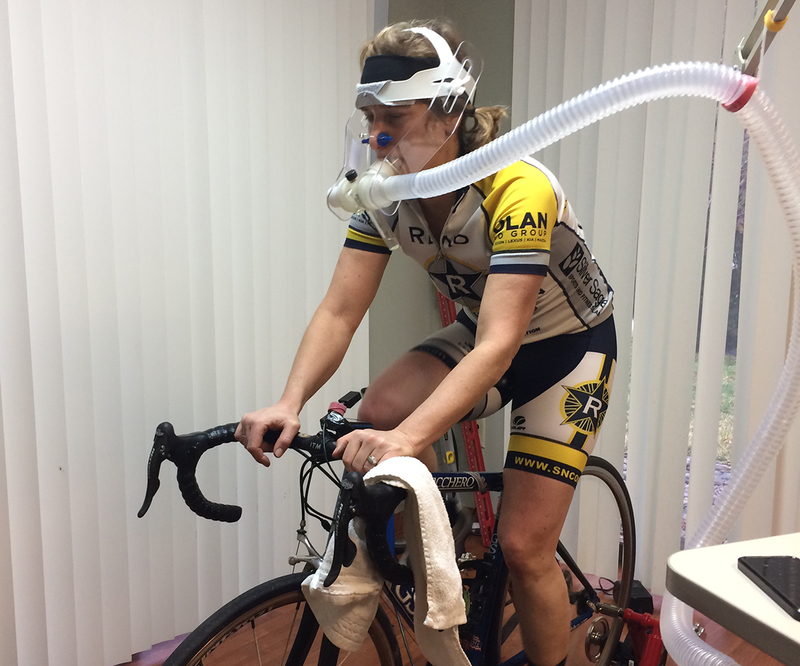 Unlike a VO2 max test, the ME test is not an all-out, tongue-to-your-knees effort. The test at Silver Sage was done on their trainer, using my bike. You get to wear some fancy head gear with a tube connected to your mouth and your nose plugged (testing your respiration gasses), and a heart rate monitor strap. It’s a bit awkward, but the effort is a low cadence endurance effort so no labored breathing. You pedal easy, increasing 10 to 25 watts every five minutes. And every five minutes, Julie pricks your ear to take a blood sample and get your lactate level. (It doesn’t hurt, promise.) The whole thing takes about an hour. I took this test because I am committed to making an improvement in my cycling performance. For me, the results have led to a pretty significant change in my diet. While I’ve always eaten what I considered good, healthy food, I was very carb heavy and I was consuming more processed carbs than I realized. I spent 6 weeks limiting my carb intake to 25 percent of calories and am now allowing myself about 35 percent (I followed the Always Hungry plan at the recommendation of another endurance athlete). I also started training with Julie, who has me spending more time in low and medium endurance zones than I have ever trained in before in my 25 years of cycling. I am still relatively early in my process. Seven weeks after adjusting my diet and five weeks after starting my new training program, I had a “test” – a rolling metric century with a group of hard-charging friends. Fueled with almost all fat and protein, I rode four hours and climbed 3,500 feet without bonking or cramping. However, at the final rest stop I ate some potatoes which provided a nice energy surge for the final miles. This reinforces another point both Julie and Sian made to me — phase your nutrition with your training. While I am doing some experimenting with my diet right now, I am erring on the extreme side and finding the break points. Our daily nutrition needs can and should change with our workouts. On a rest week I can really lower carbs, but for my upcoming race I will fuel the night before and day of with carbs and also use carbs in recovery. An all or nothing approach is not ideal. Do less guessing. Let science aid your training efforts by telling you where your deficiencies are and how you can train smarter, not harder. As athletes, we are extremely lucky to have Silver Sage’s Olympic-training center caliber testing facilities available and a testing staff that knows how to help you translate that data into performance gold.